Thoughts on education, at home and abroad. Three hundred and sixty five passes of the sun; four cyclical seasons: rain, cold, dry, and then rain again; and other measurements: forests that have changed color week by week, the births and deaths in the village that occurred within this time frame, the endless iterations of sitting on my porch at the end of each completed day. It's time for some evaluation. A halfway point summary, a review perhaps, of the organization under whose banner I labor. I joined Peace Corps for the opportunity to live in a community I otherwise would never have known existed. I was motivated by the theory that to help people you must live with them, eat with them, learn their language, and involve yourself in their social situation. I was swayed by the image of the Peace Corps volunteer, knee deep in a ditch, helping the world. Peace Corps: What is it good for? The idea was now planted. The idealism of the sixties and the soft power battle against Communism provided the inspiration for the institution. Sargent Shriver, Kennedy in-law and advocate for poverty reduction and volunteerism, served as the founder and first director of the Peace Corps. No doubt the institution was inspired by the novel The Ugly American, a harsh criticism of U.S. foreign policy in Asia which features a character who works and lives by a philosophy later absorbed as Peace Corps-ism: to live with the people, work with and for the people, and leave a small footprint but a big impact. This is the numerically ordered mantra of Peace Corps. All volunteers will be able to recite it in both English and a local national language, and describe work they are doing which falls under each. Anthropologists Without Borders. The training Volunteers receive and the areas they live in, and in fact the insulation within their community, would make any ethnologist jealous. I live in a mud house with a thatched roof built by my village, I can get by in both the local language and the local dialect, I have access to the village and the local leadership, and I get invited to weddings, rituals, funerals. The counterpoint to this is that although Volunteers received a smattering of ethnographic and anthropological tools through Peace Corps training, we are hardly trained in anthropology, to separate our biases from our observations, to conduct interviews or observations, to take full scientific advantage of our embedded-ness. Cultural Exchange. Leaving my political views out of the matter, I can acknowledge that my service has been a great opportunity for me to learn about Zambians, and Africans in general, and for them to learn about American values, culture, and attitudes. I find Zambians to be incredibly hard-working, inventive, and friendly people who happen to be stuck in between a traditional culture, a partition of recent colonialism, and the modern world which villagers are able to see but are quite removed from. Too Many Generalists Abroad. Former Cameroon Country Director for the Peace Corps Robert Strauss argues in a New York Times Op-Ed that while in the past recent college graduates were beneficial to developing countries, most now have more educated nationals than employment opportunities. 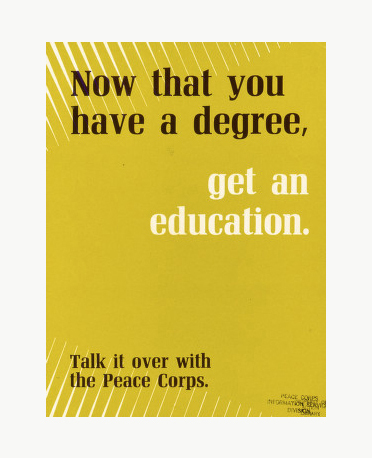 Peace Corps has come to terms with the majority of its volunteers being "generalists", which is the organization's flattering term for recent college graduates, or youths with little practical experience teaching, farming, working in health, or other areas in which host countries are requesting "trained men and women". In this effort niche programs like teacher training, the one I work under in Zambia, will be replaced by English teaching, a job more easily performed by a college graduate who is a native English speaker and may or may not have previous teaching experience. One-sided Evaluation. Peace Corps Volunteers like myself perform their own evaluations in the form of volunteer reports. While this is a useful way of recording projects and impacts in a community where a volunteer is isolated from other volunteers and Peace Corps staff, it suffers when it is the primary measure of a volunteer's work. Anyone who has graduate college is adept at making oneself look good on paper. Strauss argues that the institution "does not systematically ask the people it is supposedly helping what they think the volunteers have achieved. This is a clear indication of how the Peace Corps neglects its customers; as long as the volunteers are enjoying themselves, it doesn’t matter whether they improve the quality of life in the host countries." Centralism vs. Decentralism. In my opinion, Peace Corps hovers in between being a centrally managed organization, and being decentralized, on many different levels. Until very recently, each country office has had to build their own training from the bottom up, often with limited time and resources, while other countries have similar, if not identical, programs. Now there is a push towards having centrally created programs from Peace Corps headquarters in Washington. A flaw of Peace Corps is that, while volunteers are provided with materials and project ideas from both global and country offices, there is little formal communication between volunteers working on similar projects. For example, if I'm building an irrigation system, there might be other volunteers in other countries with similar sites and irrigation projects, but there is currently no system in place to share ideas. Information and reports can travel very slowly up the ladder, end up in Washington, and be disseminated through project materials, finding their way back to volunteers. This is not an efficient system for volunteers across the globe to share similar work, their successes and failures. Sustainability - Philosophy or Doctrine? A sociological review of HIV/AIDS programs in Malawi brings up the "doctrine of sustainability", whether the move towards making aid "sustainable" and funding workshops, skills training, and other interventions in lieu of direct aid. Like any paradigm shift, this philosophical change in how aid is delivered, which Peace Corps heavily relies on, is becoming questioned. A hasty conclusion: all of these things fit together to compose my Peace Corps service, the bad inextricably tied with the beneficial, the flaws with the advantages. Overall, though, I can't keep from thinking that I'm getting more out of this than my community is getting out of me - an inevitable self-reflection also accompanied by thoughts that I'm not doing enough, not trying hard enough. The self-critique propels me forward. Peace Corps is neither a Cold War tactic nor an independent development organization: Sargent Shriver's plans departed from the anti-Communism of the era, yet the institution is still a government agency. It flings volunteers into host countries with long yet distinct tethers, and I am one of them. Undoubtedly each volunteer will have a different experience, and opinions will contrast and contradict. Like any employees, we argue and dissent with our employer, but our discussion is not quite a debate, but a dialectic, which molds our experiences as volunteers and inevitably modifies the structure, subtly, of the organization. See the advocacy of returned Peace Corps volunteers and other, more political, positions. We are not Peace Corps, but Peace Corps is certainly us. I just got invited to go to Sambia as an English teacher from the Peace Corps. I really enjoyed your blog about your experiences in the Peace Corps. I'm an off-and-on educator, teacher, and student of educational policy.